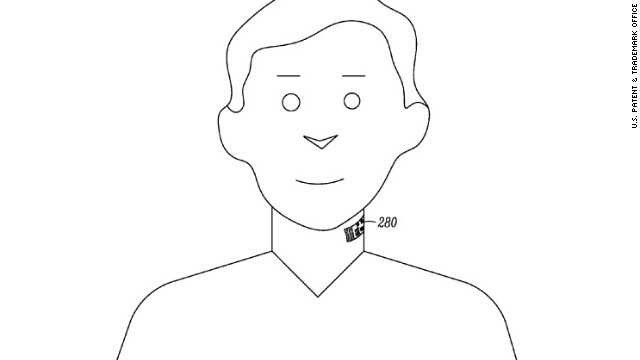 A new patent says an electronic tattoo could be attached to a user’s throat or on a collar. CNN) — It looks like Google Glass was just the beginning. Google now appears to be aiming a few inches lower, working on a temporary electronic tattoo that would stick to the user’s throat. The patent says the tattoo would communicate with smartphones, gaming devices, tablets and wearable tech like Google Glass via a Bluetooth-style connection and would include a microphone and power source. The idea is that wearers could communicate with their devices via voice commands without having to wear an earpiece or the the Glass headset. And how’s this for future tech? It could even be used as a lie detector. “Galvanic” is a reference to the way some surfaces, even skin, conduct electricity. In images attached to the filing, the tattoo appears to be between a postage stamp and a Band-Aid in size. The filing says that in addition to sticking via an adhesive to the throat, the tattoo could go on a collar or a band around the user’s neck. Other possible uses include making both incoming and outgoing audio clearer. That could mean anything from making smartphone conversations clearer in a crowded room to being able to listen to music without earphones. With Google Glass, the company has moved to be at the forefront of the rapidly emerging trend in wearable tech. Glass is a wearable computer with a smartphone-like display that lets users text, browse the Web, take photos and run other apps, all hands free. The latest version rolling out to field testers includes an ear bud, in response to complaints from some that the first version’s bone-conduction sound system didn’t work well. It’s not hard to envision the throat tattoo as an eventual answer to that complaint. Other wearable tech either on the market or the horizon includes smartwatches from Samsung and Sony, with Google, Apple and Microsoft expected to join the fray soon. A Motorola spokesman said the company has no comment about the patent filing at this time.